The following are maps of new and old Ethiopian regions, formerly known as Abyssinia and the Kingdom of Axum. It has a long and rich history dating back thousands of years. Officially known as the FDRE or Federal Democratic Republic of Ethiopia, today, with its nearly 100,000,000 citizens is the most populous landlocked nation in the world. Located in the Horn of Africa, it borders Kenya to the south, Somalia and Djibouti to the east, the Sudan and South Sudan to the west and its one time member state Eritrea to the north and northeast. One of the oldest evidences of human inhabitation was found in Ethiopia, which today occupies a massive 1,104,300 square kilometers of land. The Ras Dashen peak, located in the Semien Mountains is the highest point in Ethiopia rising to a staggering 14,928 feet or 4,550 meters. The Ethiopian region maps show how diverse the country is, in terms of vegetation, landscape, and populace. For example, Kaffa, a very fertile area, was one of the fourteen provinces in Abyssinia and this is believed to be the place where coffee was first cultivated and used. With highlands that are the largest continuous mountain ranges in Africa, fertile jungles, lots of rivers, and even the hottest settlement in the world in Dallol, there is no reason why Ethiopia cannot be called the land of plenty. The following Ethiopian region maps also show the capital and largest city in Ethiopia, Addis Ababa, which is also considered to be the capital of Africa, due to the many embassies and international organizations. Addis Ababa, Adigrat, Adwa, Agaro, Axum, Arba Minch, Assela, Assosa, Awassa, Bahir Dar, Bati, Bure, Debark, Debre Birhan, Debre Markos, Dege Bure, Dembi Dolo, Dessie, Dire Dawa, Dolo Bay, Ferfer, Fiche, Filtu, Galadi, Gambela, Garadase, Gewane, Gidami, Gimbi, Ginir, Goba, Goha, Gondar, Gore, Guba, Hagere, Harrar, Himora, Hiwot, Hosaina, Imi, Jijjiga, Jimma, Kebri Dehar, Kibre Menguist, Kusa, Mega, Mekele, Mendi, Metemma, Mojo, Moyale, Murle, Adama, Negele, Nekemte, Sekota, Semmera, Serdo, Shewa Gimira, Shilabo, Sodo, Sogata, Woldiya, Werder, Yeki, and Yirga Alem. The following is a list of 30 Ethiopian maps and what you must know about them. 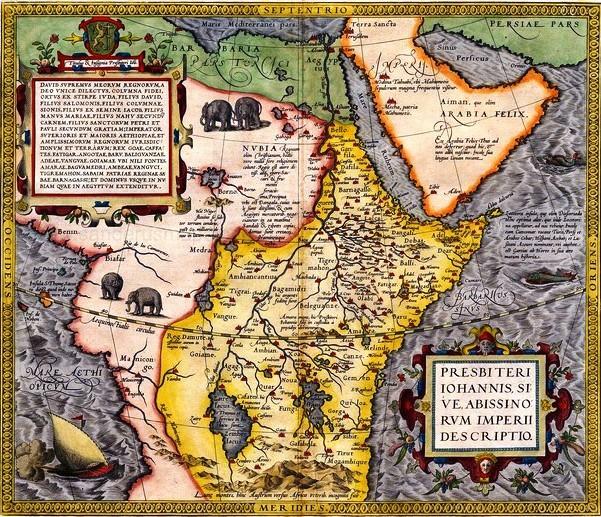 This is a map of Ethiopia, by Abraham Ortelius believed to be done in 1573 through to 1575. The Latin inscription "Presbiteri Iohannis, sive, abissinorum Imperii Descriptio" roughly translates to Description of Prester John's Empire of Abyssinia. It was believed by Europeans that a powerful and wealthy ruler named Prester John ruled a mysterious Christian empire in Africa. The following map is based on the beliefs of Pliny the Elder who had stated that Aethiopia was formally known as Atlantia. Proclus, a Greek philosopher was also convinced that Atlantis existed in the name of Ethiopia, quoting "The Ethiopian History of Marcellus". J.A. Rogers in 1650 published a book with this map showing the South Atlantic Ocean as the Ethiopic Ocean, and the entire central Africa is given the name Ethiopia. The following is an antique map of Prester John's Abyssinia and East Africa by Pieter Van der Aa, a Dutch publisher, artist, and engraver in 1706. This map is of "Negroland and Guinea" by Herman Moll in the years 1729-1736 depicted his view of Ethiopia. It was done to explain which European colonists claimed ownership over which areas in Africa. This is an old Ethiopian map from 1963 that is an administrative and political guide, but also includes cities, railroads and roads. This is an old Ethiopian topography map from 1969 that is an administrative and political guide, but also includes cities, railroads and roads. This is an old Ethiopian administrative divisions map from 1969 that also includes cities, railroads and roads. This is an old Ethiopian map from 1969 that is an administrative and political guide, but also includes cities, railroads and roads. This is an old Ethiopian topography map from 1972 that is an administrative and political guide, but also includes cities, railroads and roads. This is an old Ethiopian map from 1972 that is an administrative and political guide, but also includes cities, railroads and roads. The following map is a depiction of the Ethiopian and Somalia boundaries in 1975. The following is an old CIA map of Ethiopia in 1976. The map includes economic activity, population, ethnicity, and vegetation of all the regions in Ethiopia. This is a map by the Derg Regime in 1978 depicting the different nationalities and areas. This is an old Ethiopian topography map from 1979 that is an administrative and political guide, but also includes cities, railroads and roads. This is an old Ethiopian map from 1990 that is an administrative and political guide, but also includes cities, railroads and roads. This is an old Ethiopian map from 1999 that is an administrative and political guide, but also includes cities, railroads and roads. This is an old Ethiopian and Eritrean map from 2009 that includes cities and roads. 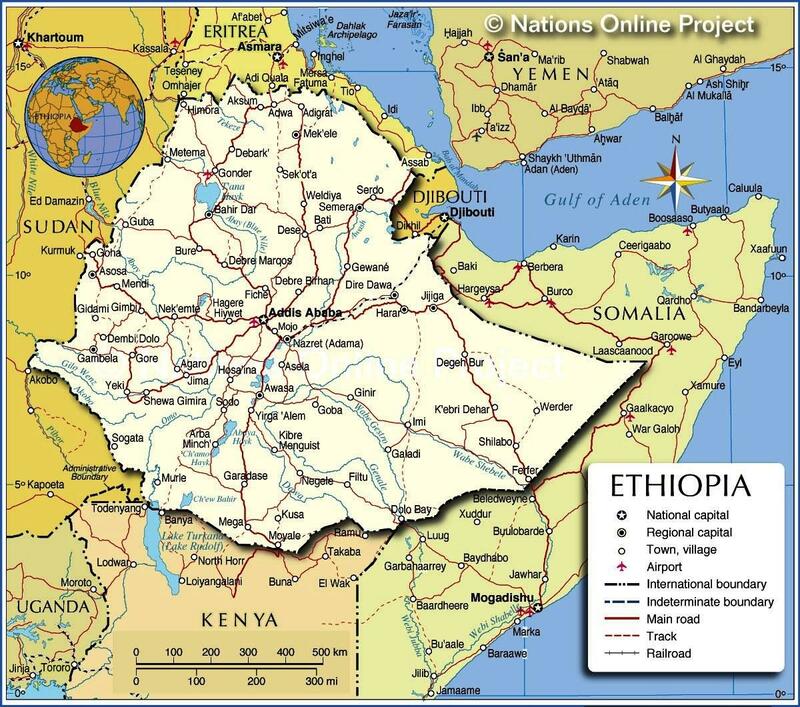 This is a detailed map of Ethiopia prepared by the United Nations. This is a satellite image of Ethiopia which shows the topography among other aspects. This is a detailed satellite image of Ethiopia showing vegetation as well. This is a the latest political map of Ethiopia. This is a the latest road map of Ethiopia. This is a detailed road map of Ethiopia. This is a the latest elevations map of Ethiopia. This is a the latest local fauna map of Ethiopia. This is a the latest national parks map of Ethiopia. This is a the latest detailed national parks map of Ethiopia. This is a the latest airports map of Ethiopia. This is a the latest physical map of Ethiopia. This is a map depicting Ethiopia's location in the world.